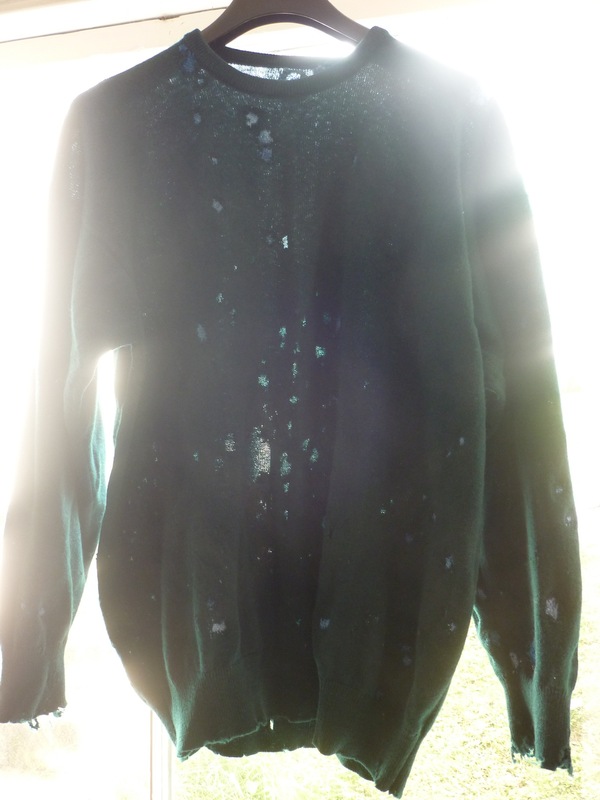 Bye Bye Boring Jumper, Hello Amazing Jumper! As you can see, there’s plenty of different patterns to make, and yet I think I’ll run out of jumper before running out of ideas! 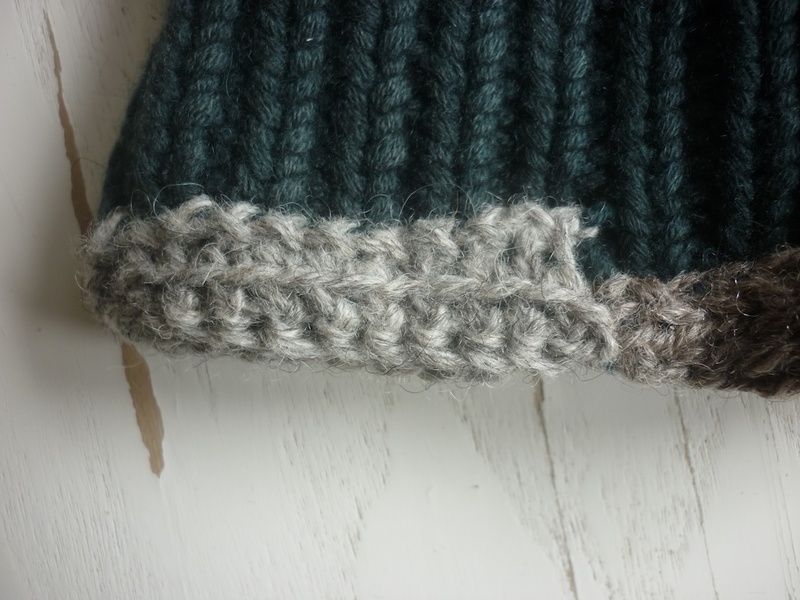 In some patterns I pick up a single “leg” of a knit stitch, in others I pick up a whole stitch, or even more. Some of these patterns are based on existing patterns from other sources. There are quite a number of herringbone variations, a Prince of Wales Sanquhar tweed pattern, and a simple houndstooth, too. As an aside, when I was browsing through a stumpwork book, it turns out that in this needle lace tradition it is called Corded Single Brussels Stitch, but, as a few people have pointed out, it also appears to be a variation of nålbinding. 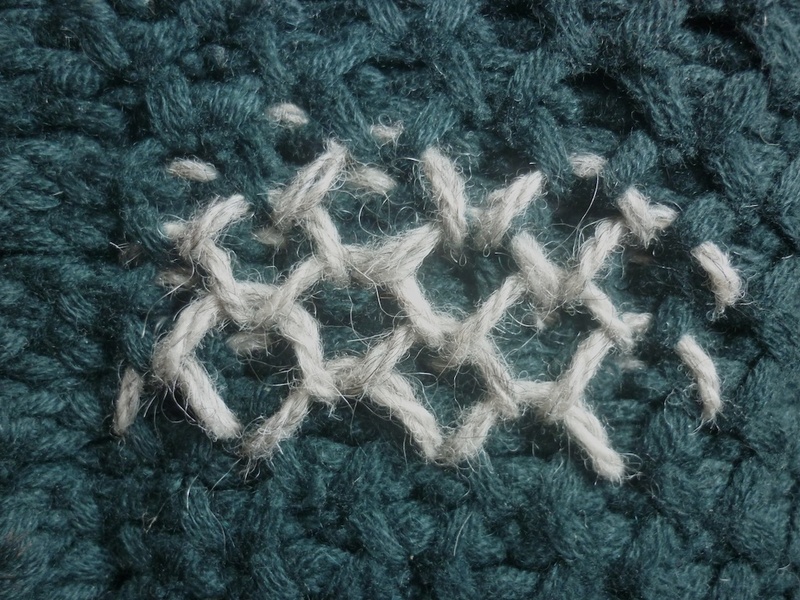 Whichever name you use for this stitch, I just love the way it looks. 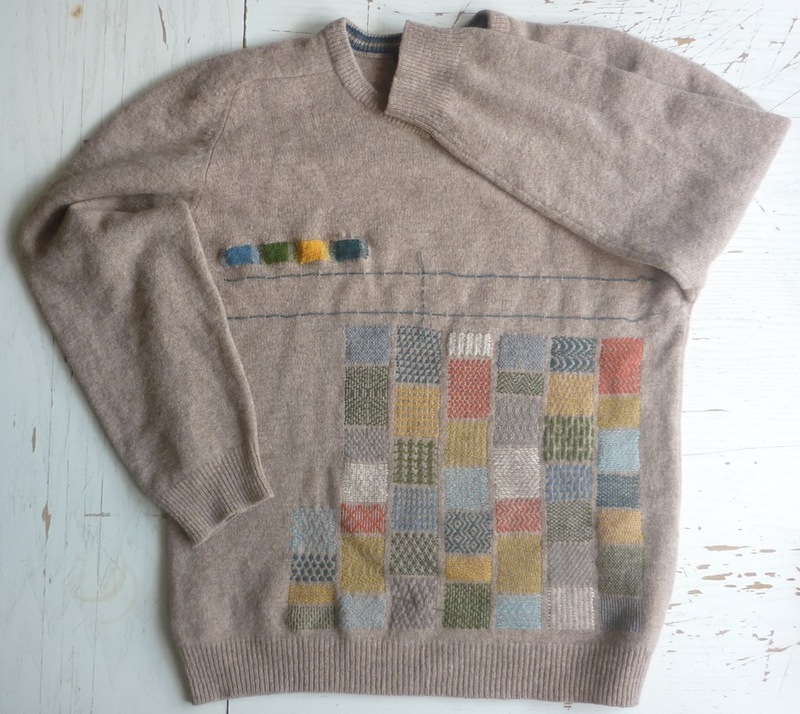 It might take a little while yet to finish the Hello Amazing Jumper, but I will be taking it to my one-day darning workshop to share these techniques at Hope & Elvis on Saturday, 4 May (please note, this is now fully booked.) 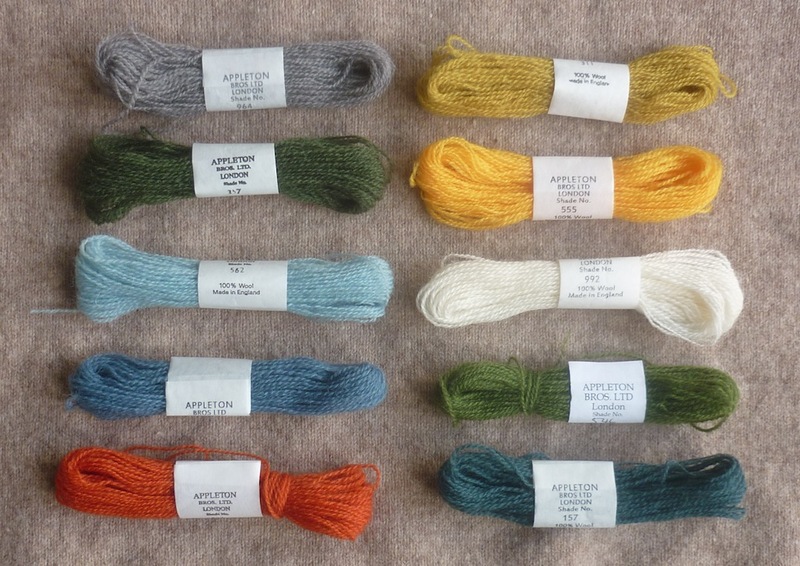 I will also run the same workshop in Glasgow, on Saturday, 18 May at The Stitchery Studio – for which there are still a few places available. 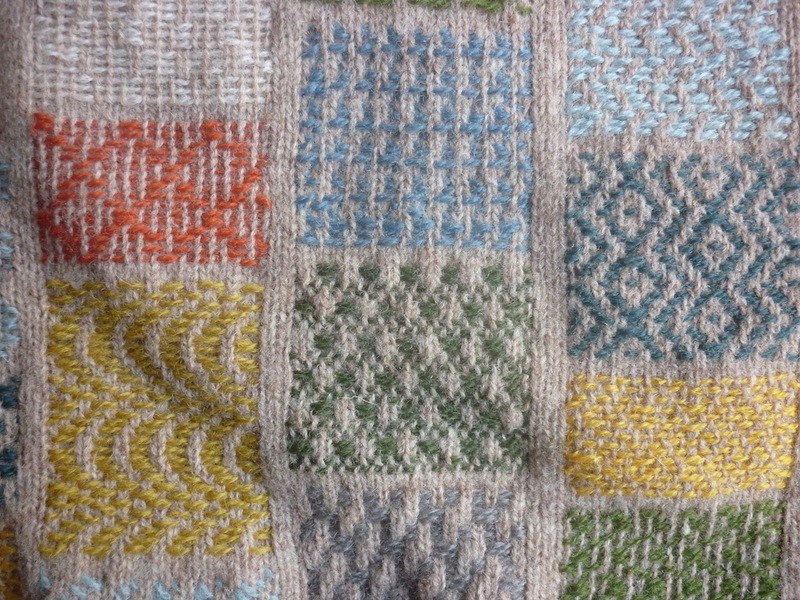 Last but not least, I’ll be running my usual darning class at Super+Super HQ on Friday evening, 10 May. 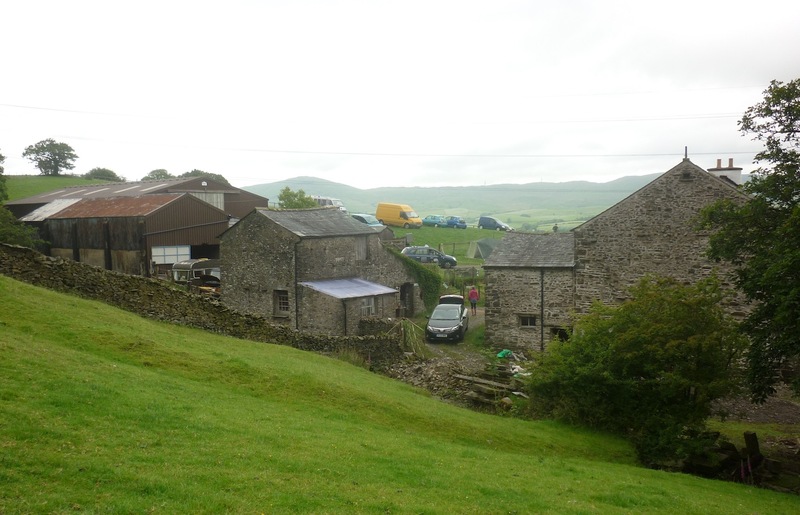 As many of you will know, I attended the UK’s first research symposium on mending. MendRS took place on the first weekend of July and today I want to share my reflections on the symposium as part of the MendRS Blog Tour; at the end of this post you will find all the other dates past and future. I didn’t quite know what to expect from the symposium and I decided to go with an open mind and a blank slate. It was amazing how quickly I felt at home at the barn and how quickly we got to know each other. It soon became clear that despite all the different areas of interest from the participants, there seemed to be a common underlying mindset: if something is broken, whatever this might be, the first question any of the MendRS participants ask is “can this be repaired” and not “can this be replaced.” We all felt this approach is no longer a common one, as everything seems to be available in abundance and mostly cheaply, too, and most people choose the perceived easier option of replacement. After this weekend of sharing thoughts and listening to talks in a relaxed environment, I realised that the scale on which people work is very different. 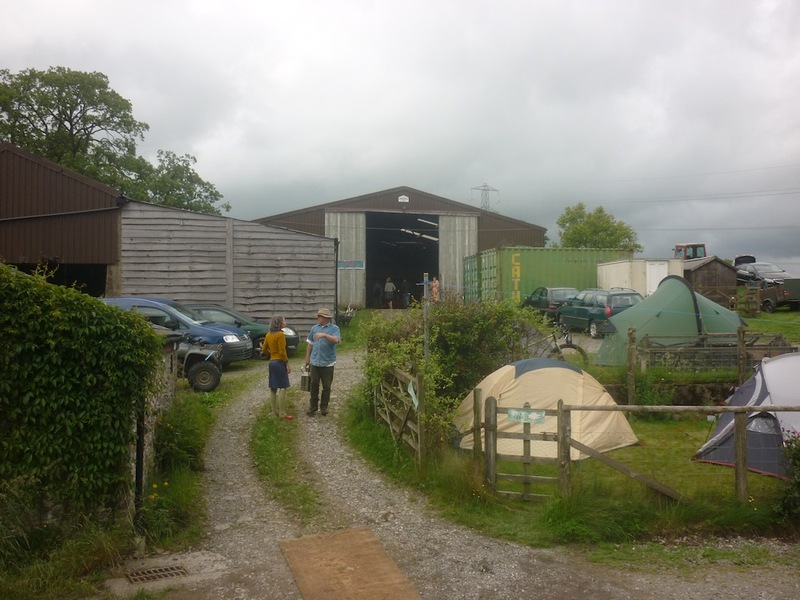 Some people think big and would like to see policy changes, all the way down to where I feel most comfortable: a very hands-on practical and personal approach through the Visible Mending Programme. 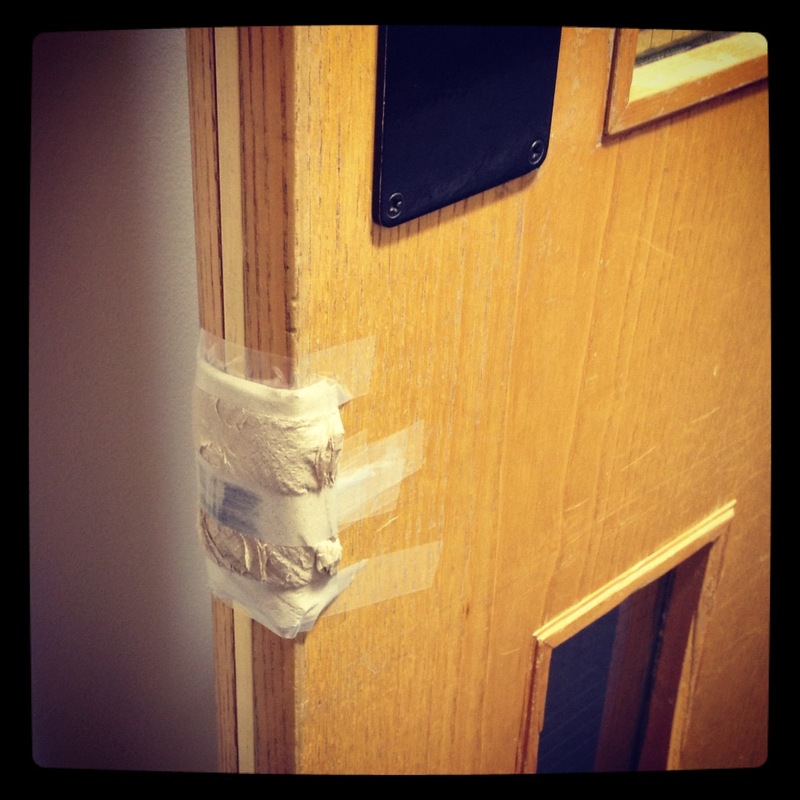 Attending the symposium has shown me the validity of this approach, and I want to continue providing repair inspiration, skills and services and share the joy of mending! 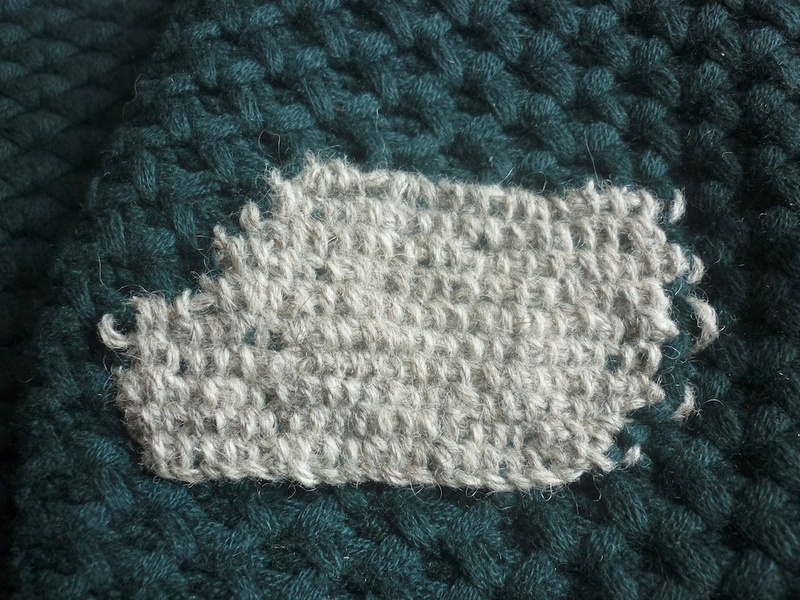 Here’s a teaser of my next mending project. 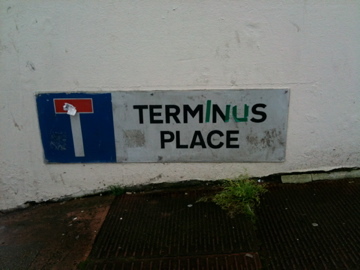 All shall be revealed in due course on my blog, so keep an eye out. 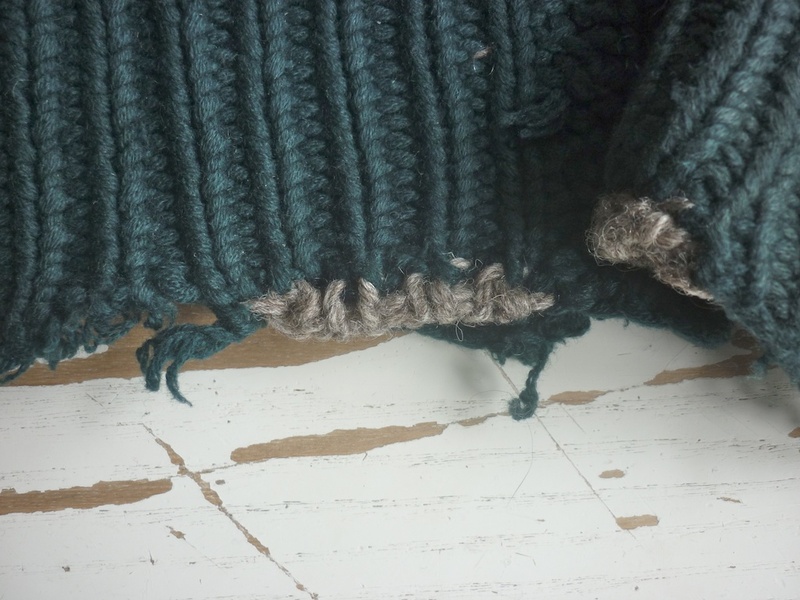 The first Mending Research Symposium in the UK, MEND*RS, will take place 29 June-2 July. Needless to say, I’m more than a little excited to take part. 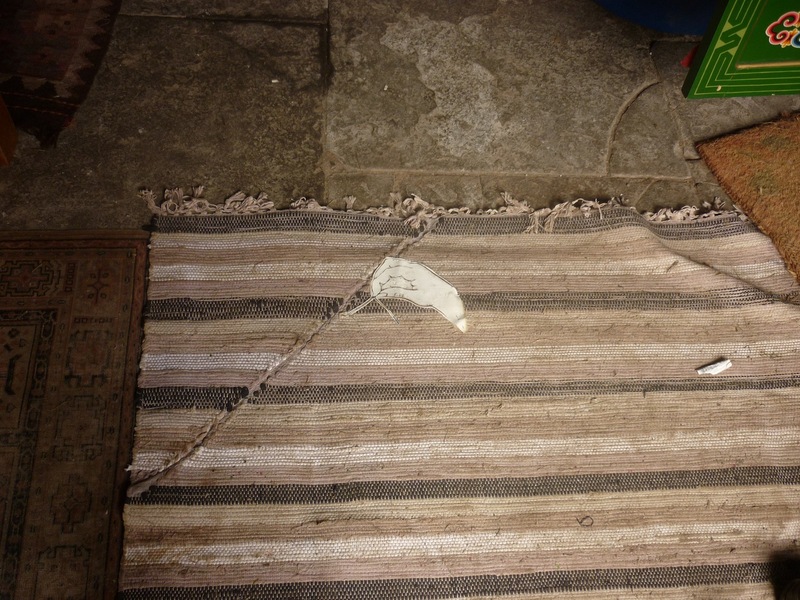 Not only will I be talking about The Visible Mending Programme, I will also be MEND*R in Residence. 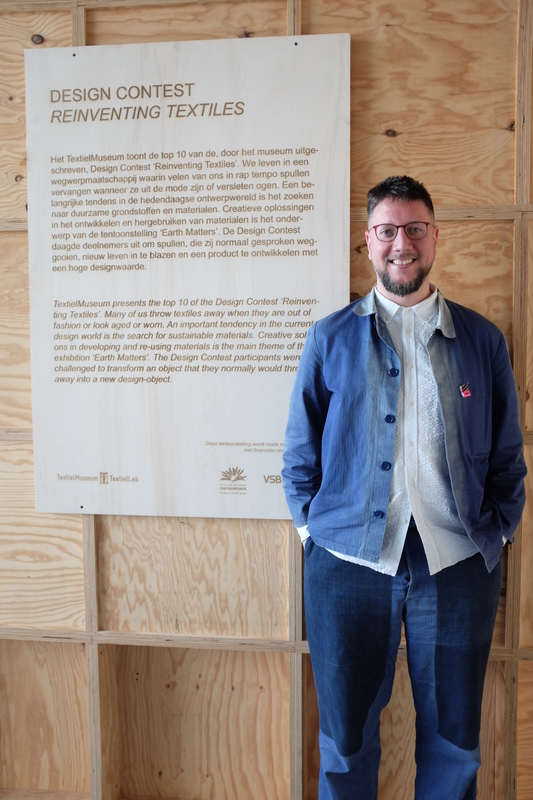 So today I’d like to share with you the project I will be working on during the symposium, and also how and why I started The Visible Mending Programme. 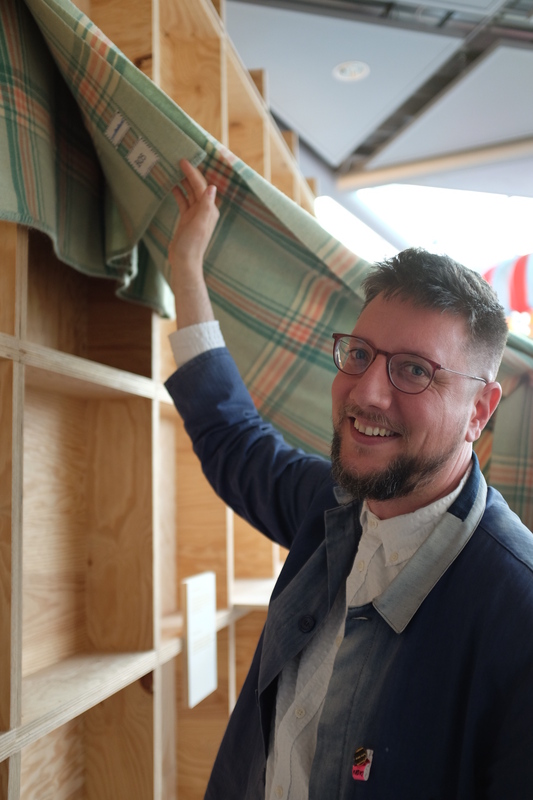 Most of my mending efforts focus on clothes, and I believe that the art and craftmanship of clothes repair is particularly relevant in a world where more and more people voice their dissatisfaction with fashion’s throwaway culture. 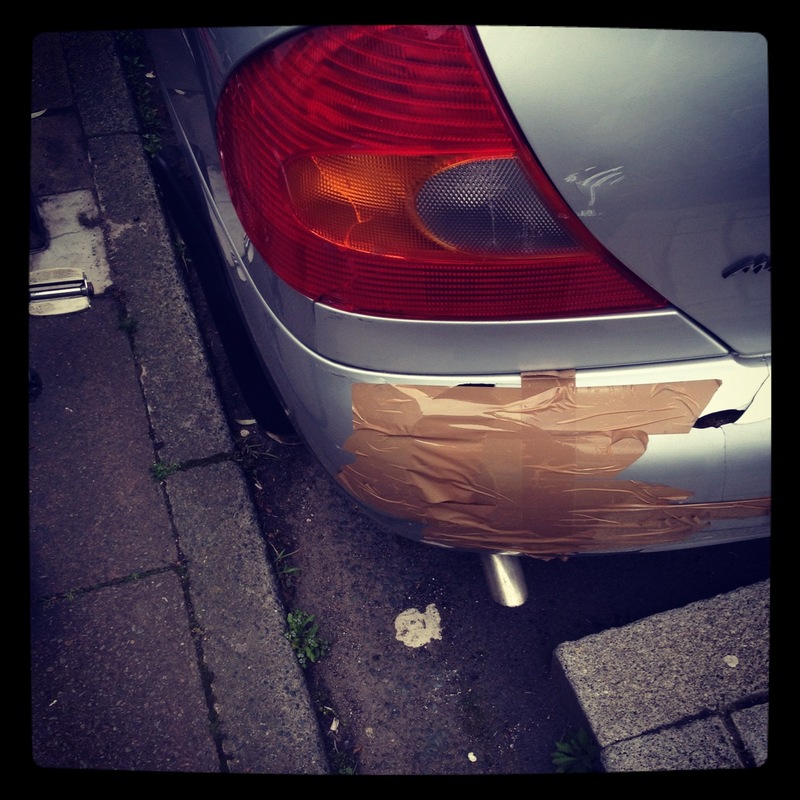 Looking at the MEND*RS programme, I think this will be highlighted in quite a few talks. 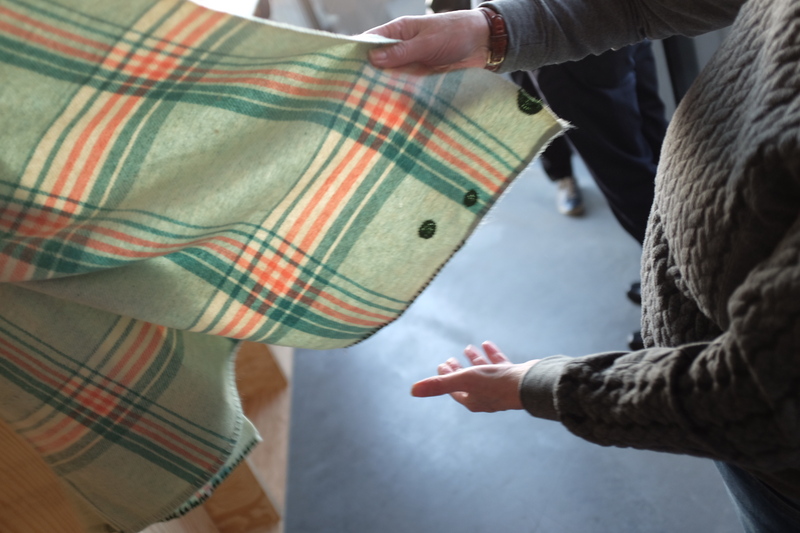 By exploring the story behind garment and repair, I try to reinforce the relationship between the wearer and garment. 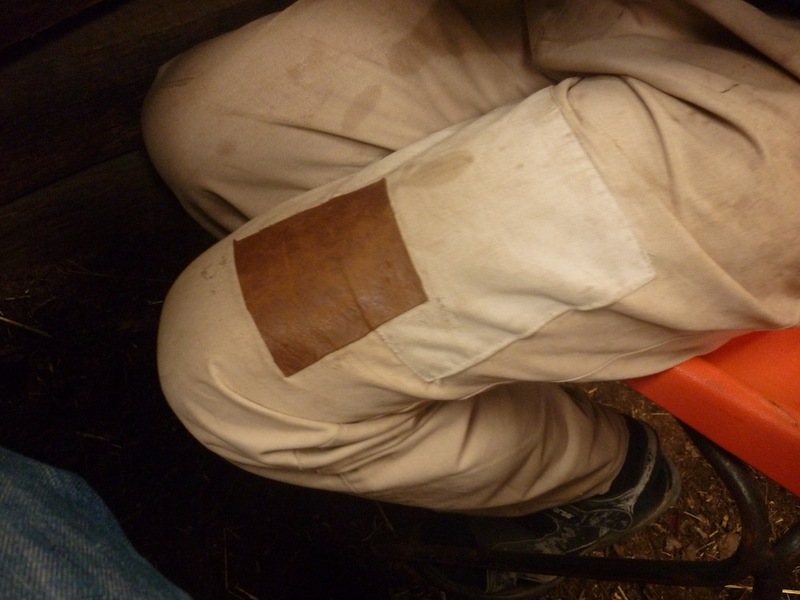 This will enable people to wear their existing clothes for longer, with the beautiful darn worn as a badge of honour. 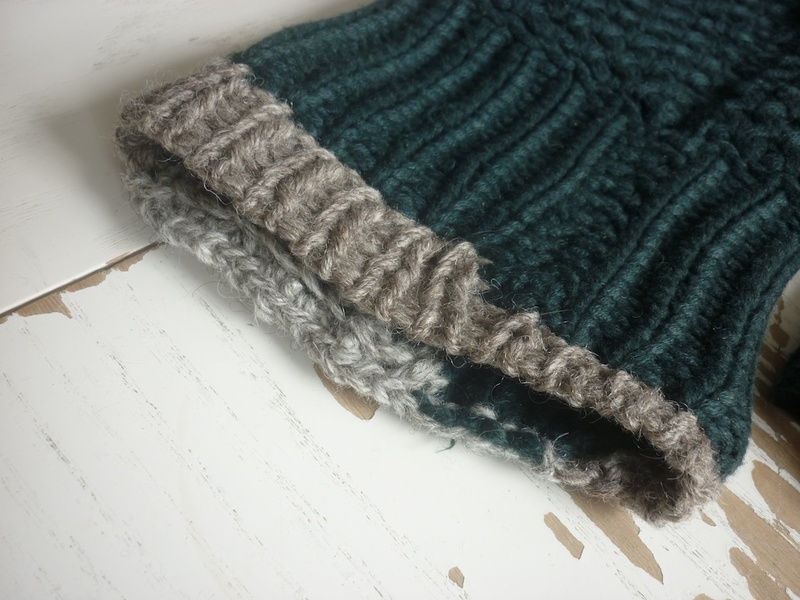 As regular readers of my blog will know, I take pride in my craftsmanship of hand-knitting, and once I’ve finished a garment, I want to take good care of it. However, I have realised that this urge is not quite so strong for clothes purchased on the High Street, even though they were probably produced by highly skilled makers. 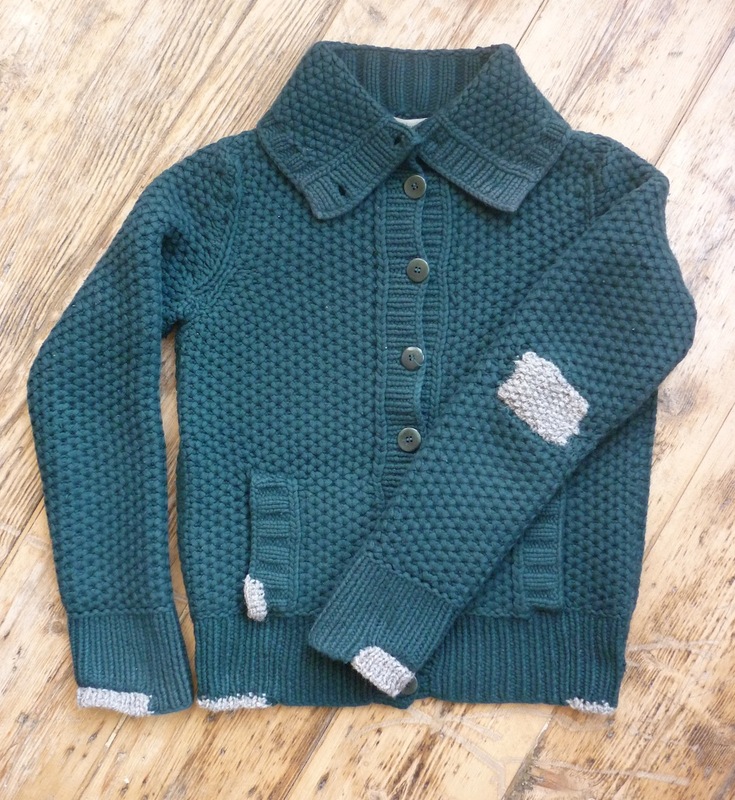 Although considerable constraints on time and material can affect their quality, these shop-bought clothes really ought to deserve the same care as a hand-knit and thus extend their longevity. Hand-knitting creates close ties with the object made; tracing its evolution and progress reminds one of where, when and how it was made. 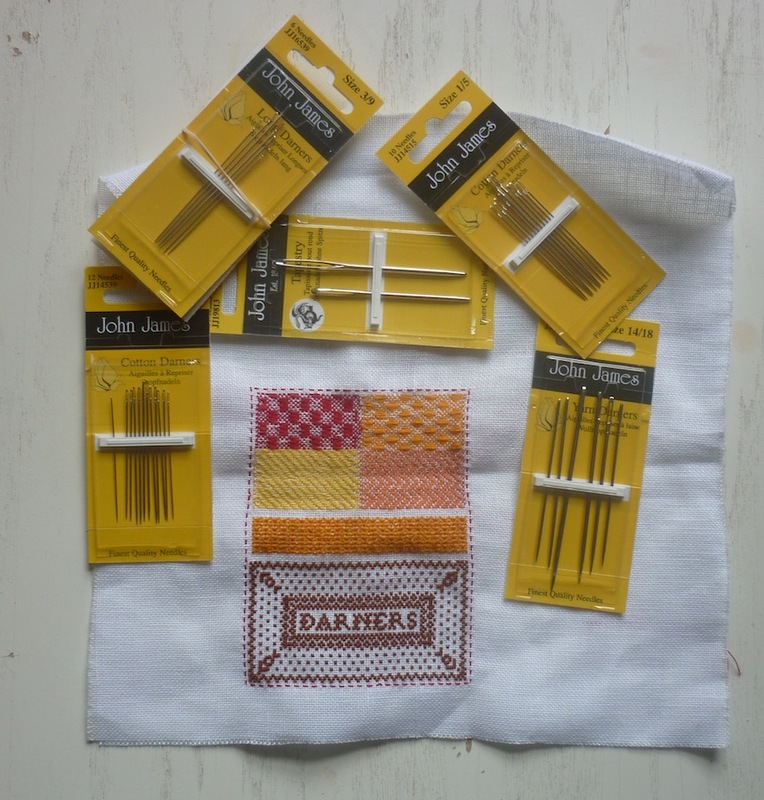 A good darn also requires craftsmansship, and the experience of the mending process allows one to create a similar connection with shop-bought clothes. Thinking about how the garment was acquired, the occasions it was worn and the motivation fo the repair can reinforce that relationship. 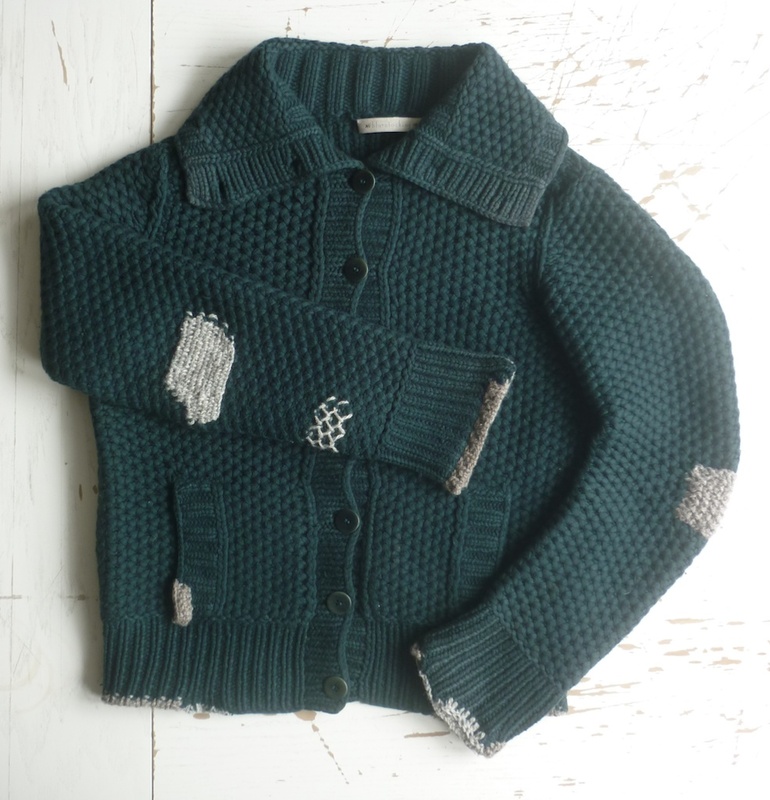 By writing this blog, running darning workshops and taking repair work commissions I hope to provide inspiration, skills and services to people and persuade them that shop-bought clothes deserve care and attention too, just like that precious hand-knit. 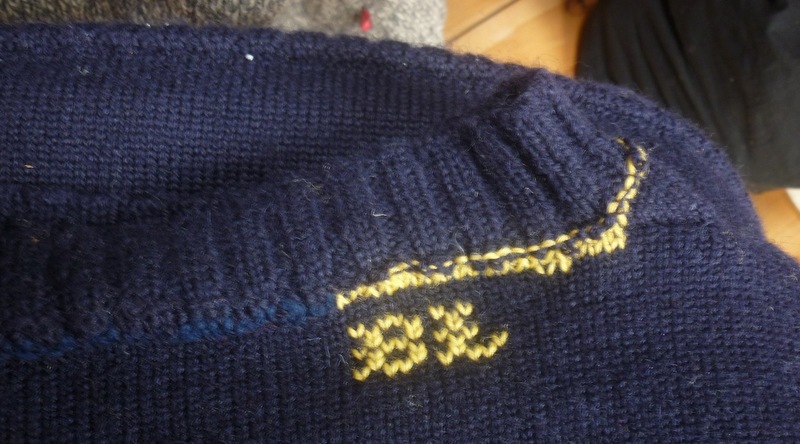 During the Symposium I shall continue my darning efforts on this jumper, although I don’t think I shall be able to complete it. 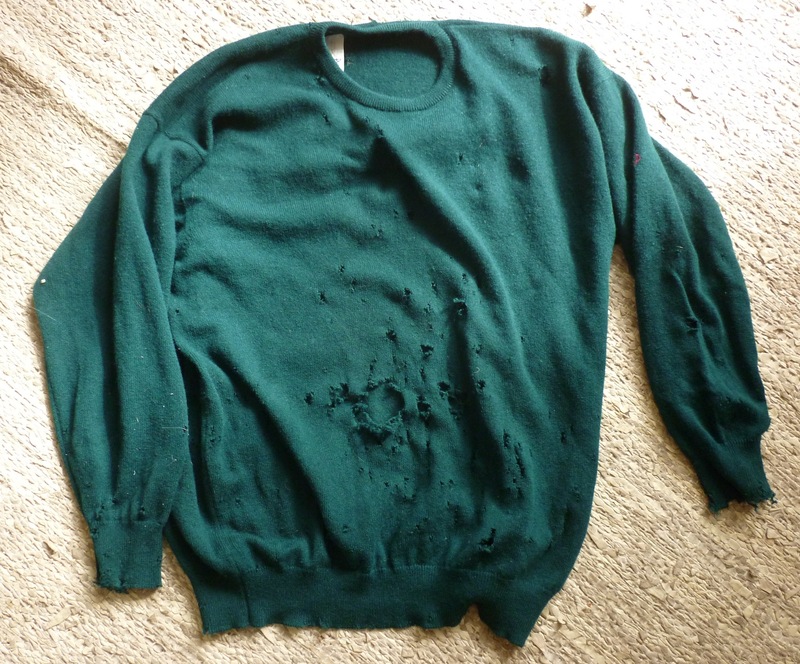 Not only are there too many holes too count, but I will also offer on-the-spot Visible Mending services for any participants attending the symposium. I’m really looking forward to participating in the symposium; I hope to be inspired by all the different aspects of mending and repair, meeting fellow menders, and learn some new techniques. 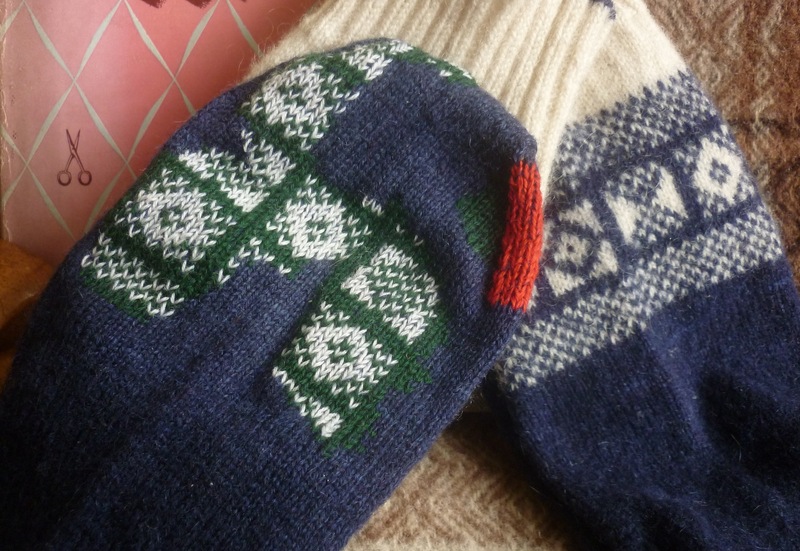 The Sanquhar socks I knitted last year have seen a lot of wear this winter and even well into spring and when I washed them the other day suddenly loads of holes appeared. These socks are one of my favourites because they are so very comfortable and I managed to get the fit just right. 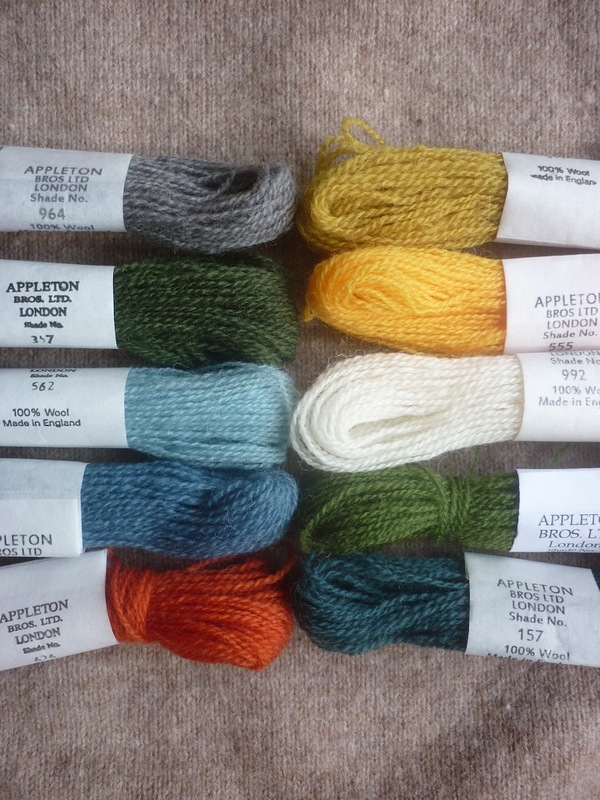 The 2-ply yarn I used (a wool and mohair blend from Blacker Yarns, alas no longer available) is soft yet has a lot of spring and was quite hard-wearing, considering how much I wore them. I’m also still very pleased with how the Sanquhar-inspired design came out. 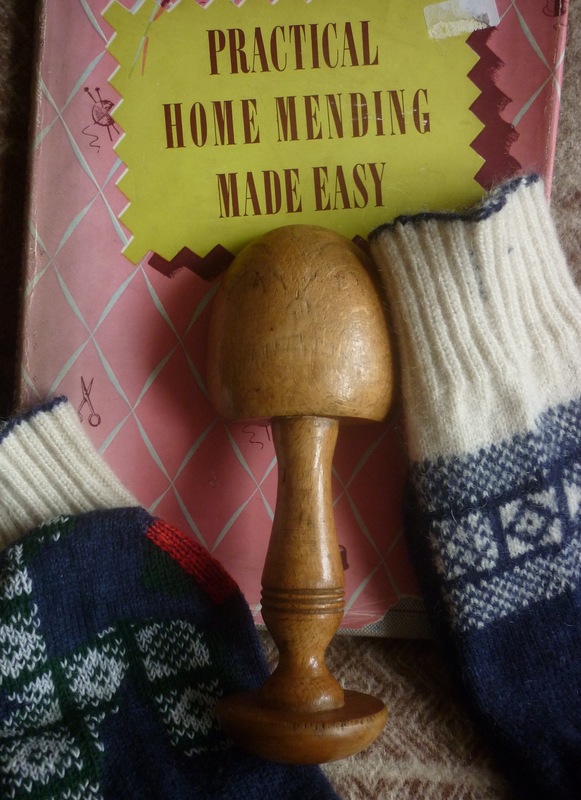 In other words, a good opportunity to reread those chapters on darning in one of my favourite mending books to ensure I’m going to do a really good job. The darning tool I used for this job has a mushroom end for holes in the heel, and a toe-shaped end for holes in the, you guessed it, toes. I picked it up in a car-boot sale, and the toe-end is particularly well-designed. 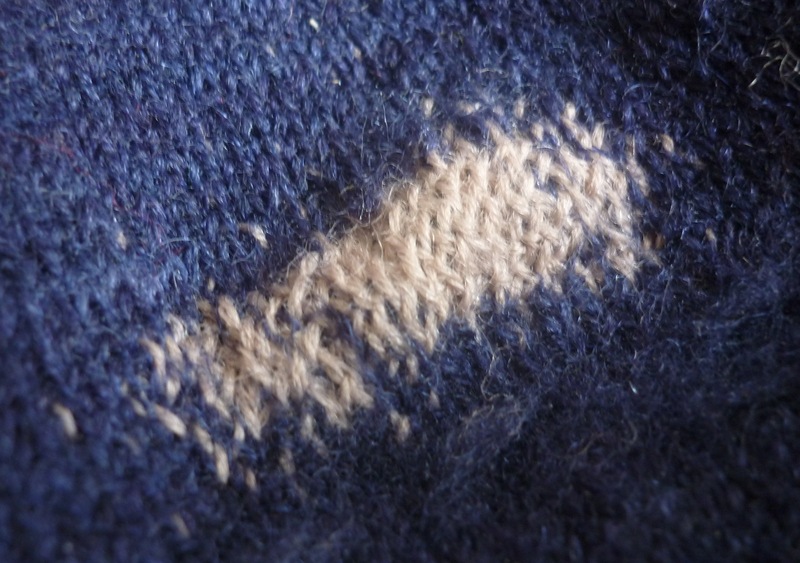 A close-up of my darning tool reveals that somebody didn’t like it as much as I do! (click on the picture to see a larger version: GRRR!) 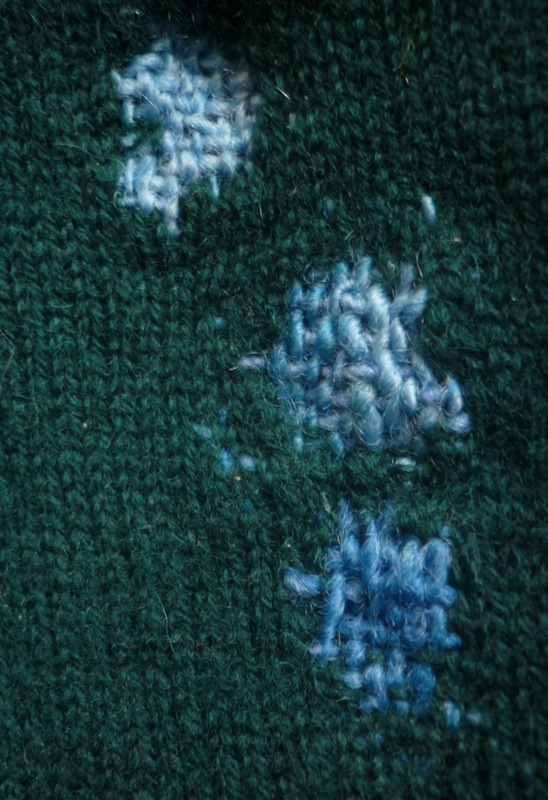 I guess that in former times, when darning was seen as a necessity, and a skill every woman was supposed to possess, a little girl didn’t like it one bit. This is so different from my own views and feelings. 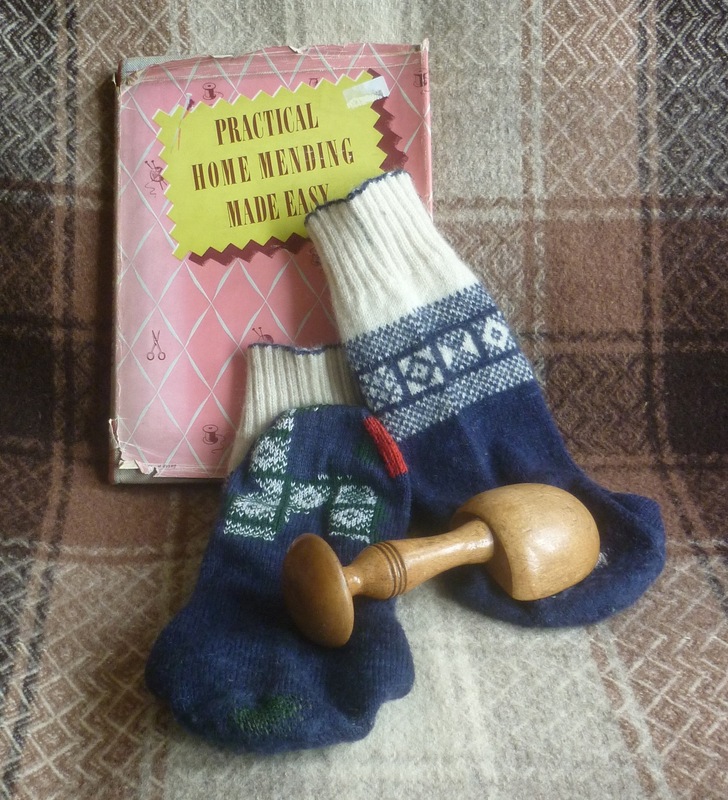 In a society where it is easier to throw away and replace than repair (for whatever excuse), I often get the feeling that people think of darning as a hobby and a luxury. 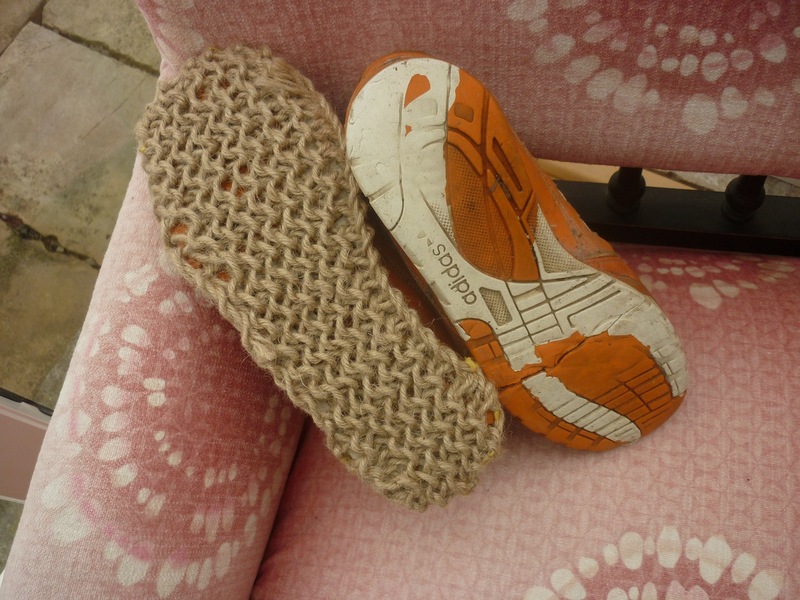 But I like my hand-knitted socks, if only because the fit is unsurpassed and it gives me pleasure to be able to make such an everyday item myself. 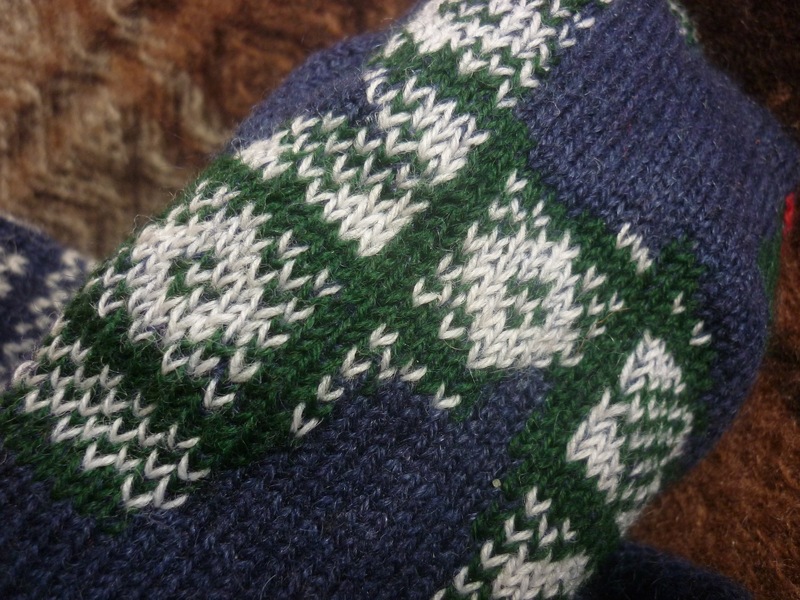 As these socks took some time to knit (11 stitches to inch!) I want to be able to wear them for as long as I can possibly make them last. 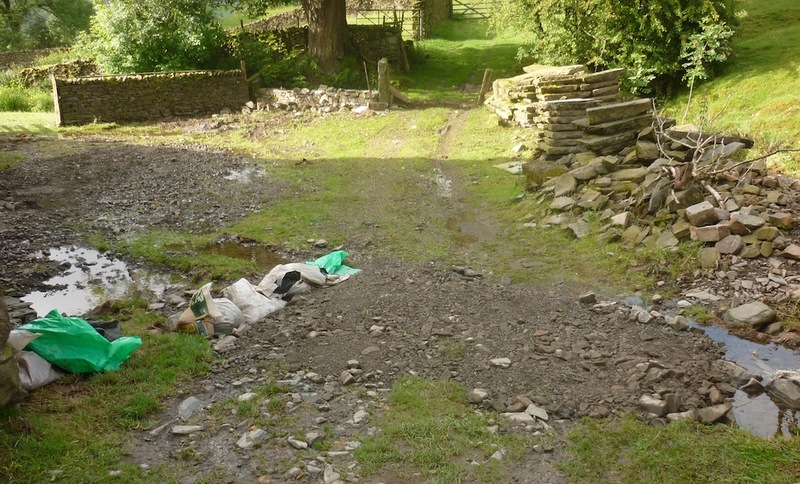 Whilst I was examining the holes, I also noticed thin areas under the ball of the foot and on the side of the big toe. So not only did I need to fill in the holes with stocking darns, but I also wanted to reinforce the thin areas to prevent holes forming. As you can see, these threads cross each other at the diagonal, and not in the more usual perpendicular fashion. This is supposed to give the darn more stretch. I shall report back in due time, although so far, I haven’t noticed any difference. 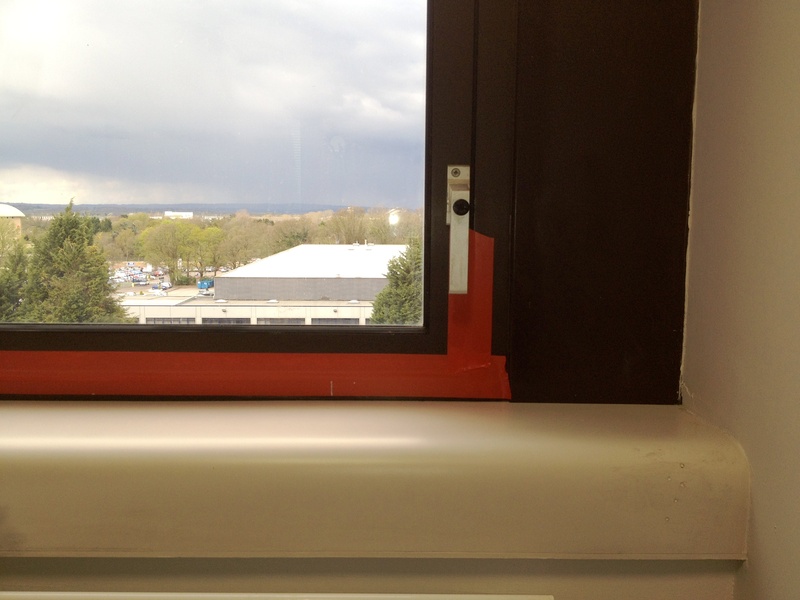 Secondly, as I like a Visible Mend, I decided to mix up the colours. 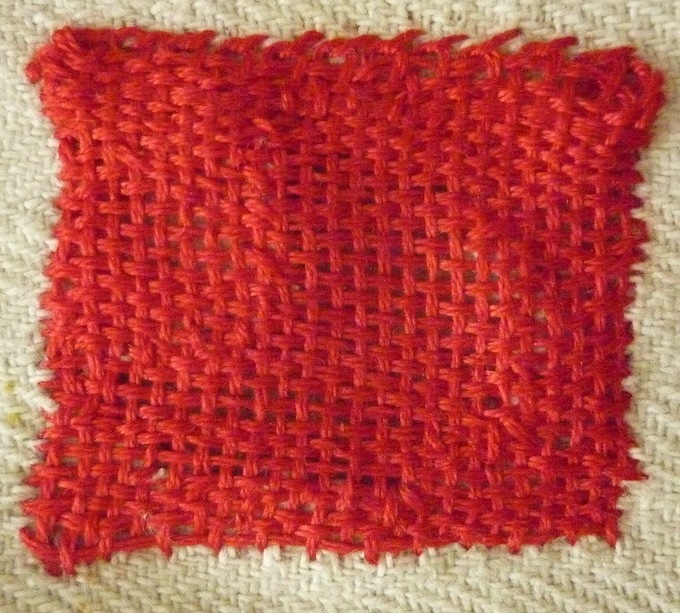 Solid patches in Swiss darning, and the stocking darn is speckled due to different colours for “warp” and “weft”. 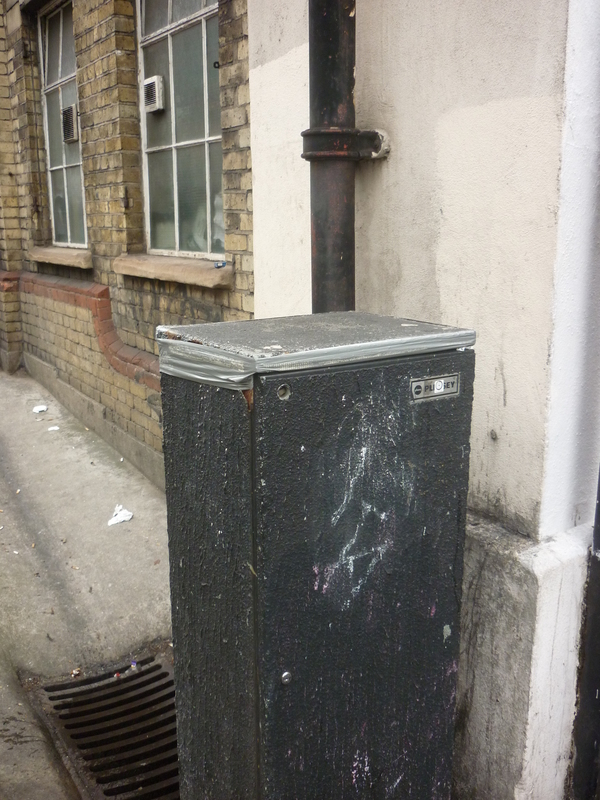 But as you can see in the following picture, it didn’t stop there. My cuff design was calling out to be re-used! And so, esteemed Ladies & Gentlemen, the meta-darn was born. This self-referential pattern took me a quite a bit longer than a plain darn, but I had so much fun doing it. 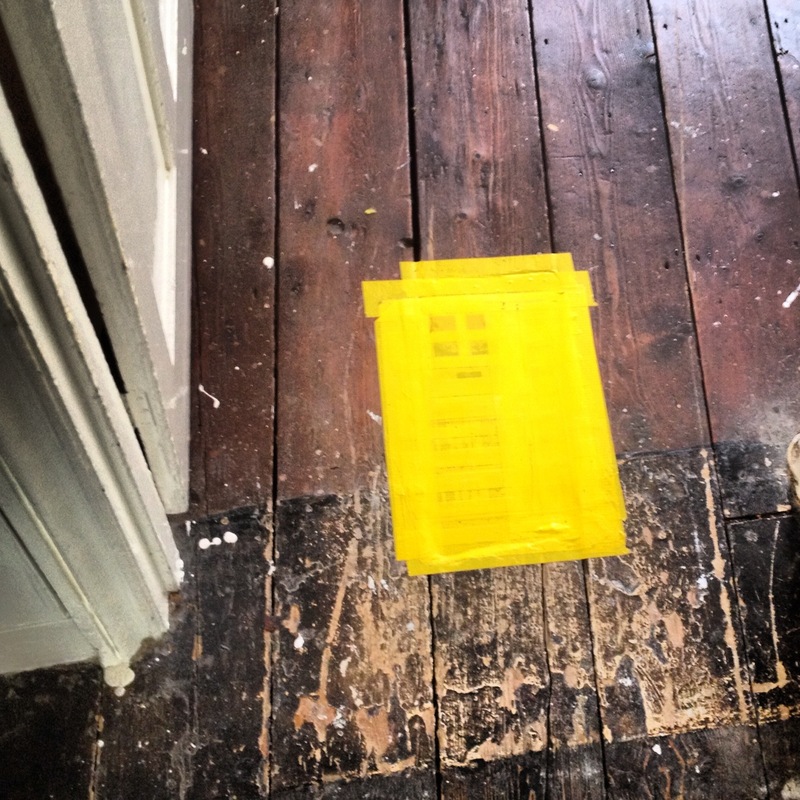 Suddenly the slightest shadow of a hint of an inkling of a possibility of a thinning area required to be reinforced. I’m very interested in adding something, which is related to thing added to. 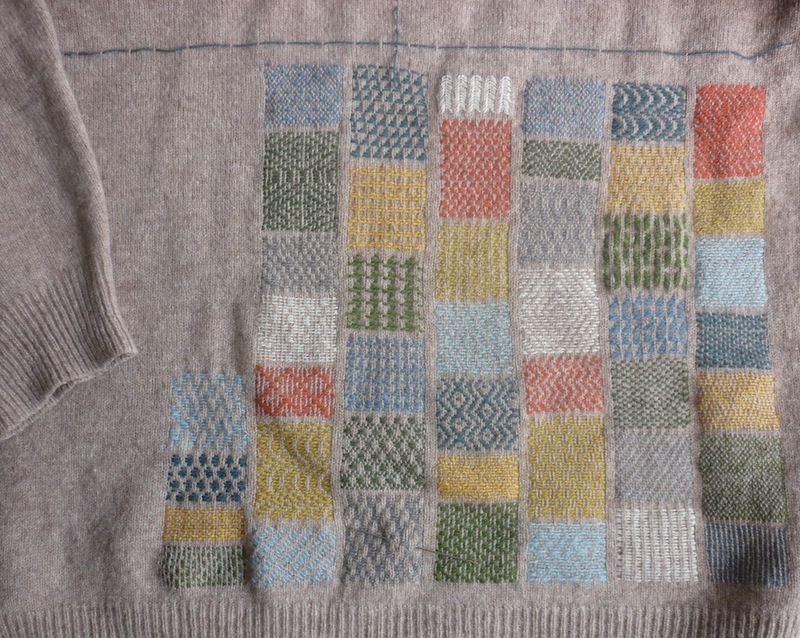 Another good example of “meta-interventions” is Amy Twigger Holroyd’s stitch-hacking work. 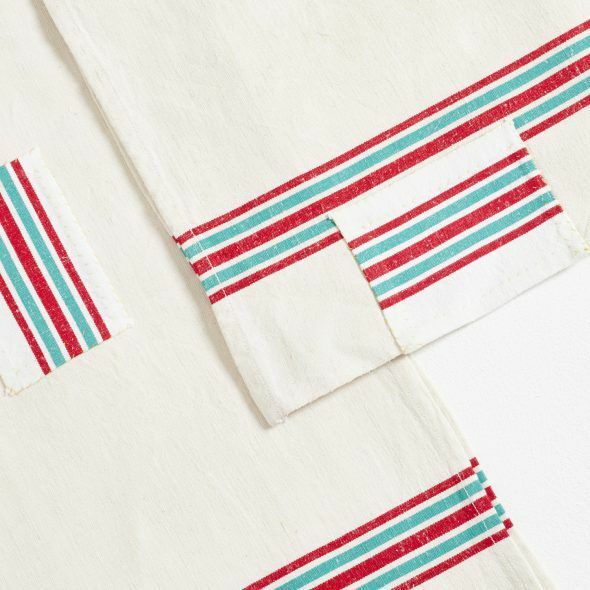 As she says about stitch-hacking: “The [technique is] used to adapt existing garments and patterns to include personalised content. On a conceptual level, these pieces explore authorship and ownership; on a personal level, they allow me to put something of myself into my wardrobe.” *) Although Amy is talking about shop-bought clothes, which sometimes lack a certain individuality, this principle can also apply to hand-made things (although admittedly, the authorship and ownership does not get questioned as much here). In these socks, the cuff pattern gets referenced, and so the darn not only reinforces the fabric, it also reinforces the design. 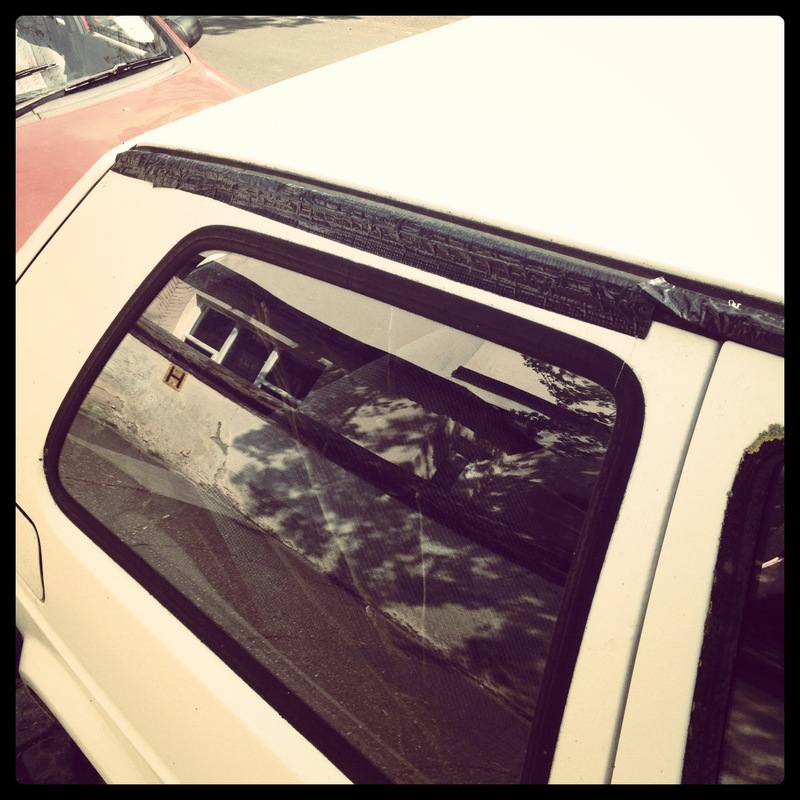 I limited myself to the areas that needed reinforcing, so the pattern isn’t complete. It looks like an ancient Roman mosaic, or half-stripped wall paper. 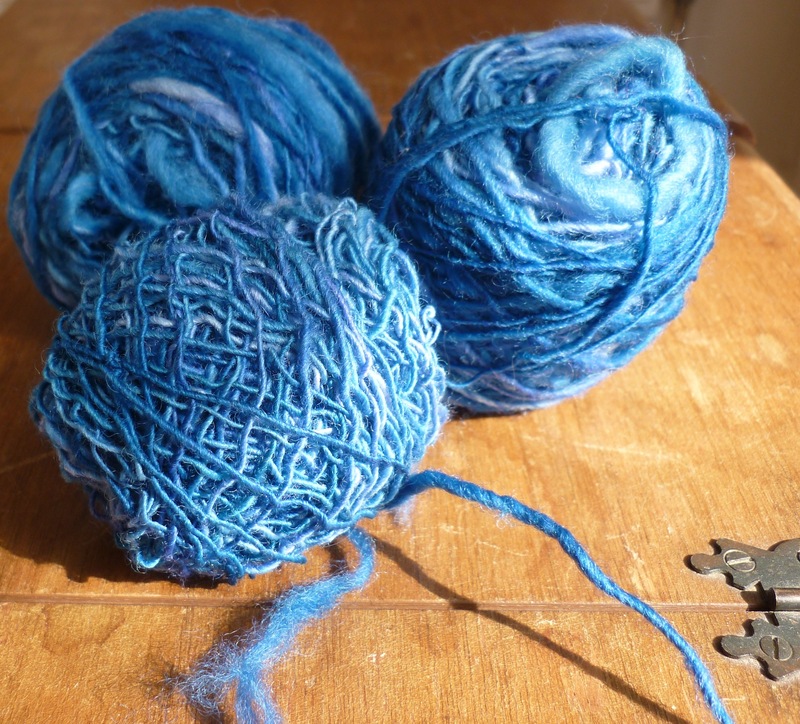 I’m not sure how this mending yarn will wear, as some of the mending threads I’ve used tend to get fuzzy. However, to me that is going to be an exciting development to follow. 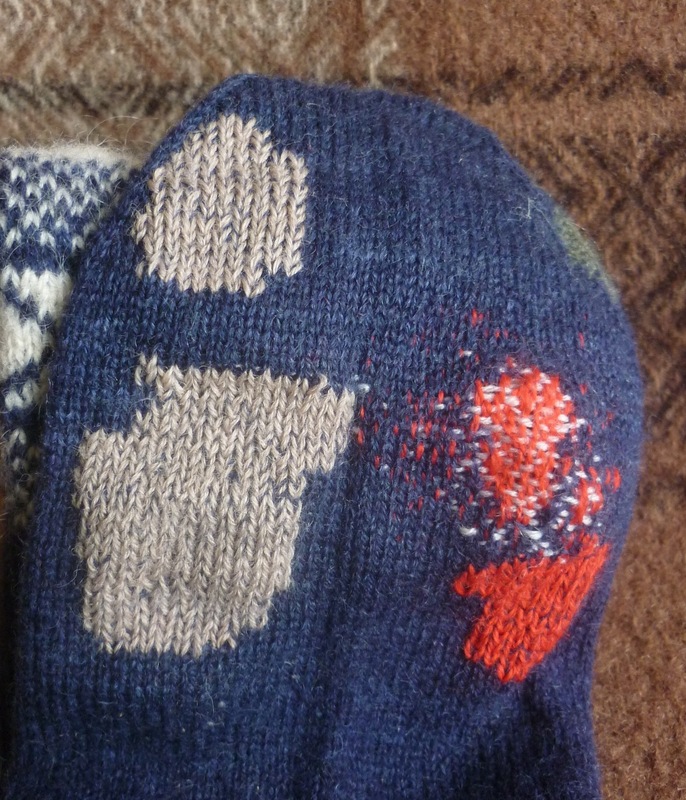 Will this design still be legible after having worn these socks for another winter? And once this has worn out, will I be able to perform another Swiss darn, will I need to do a stocking darn, or will I eventually have to resort to refooting the sock? Perhaps for some, these socks are just temporarily stopped on their way out, but for me, the journey with these socks has only just begun.